EBSCO Executive motivates Publix campaign teams – United Way of Central Alabama, Inc.
Jim Stephens, Board Chairman EBSCO Industries and Tocqueville Society Member, spoke to Publix Super Markets United Way campaign coordinators today during their campaign coordinator training. Stephens chronicled his life’s work but in so doing expressed his support of United Way. Local Publix Super Markets around the five county area campaigns run Sept. 1-11. 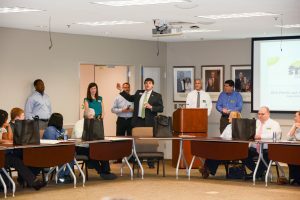 EBSCO Industries campaign coordinators’ training takes place in late September where Publix Super Markets Atlanta Division District Manager James Mowery will serve as a guest speaker. Mowery also serves on the United Way Board of Directors. 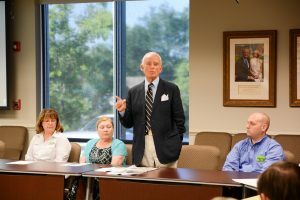 Jim Stephens, Board Chairman EBSCO Industries and Tocqueville Society Member, motivates the Publix Super Markets campaign coordinators during a coordinator training recently.